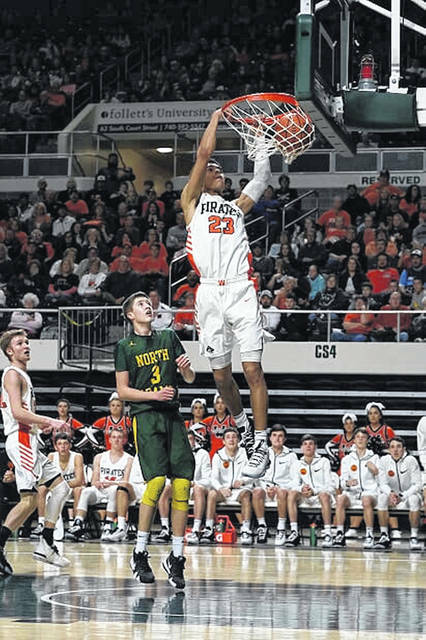 PORTSMOUTH – Tuesday afternoon, the Ohio Prep Sportswriters Association released their all-state teams for Division III and IV for the 2018-19 season. In the Division III ranks, Wheelersburg senior Tanner Holden was named first team all-Ohio after helping lift the Pirates to a 26-1 record, back to back district titles, and an outright SOC II title. During his senior season in which he also was awarded SOC II player of the year and Southeast district player of the year, Holden averaged 27 points per game while shooting 64% from the field and 43% from behind the 3-point line, 11 rebounds per game, and two assists per game. Two Scioto Countians were named as honorable mentions in the all-state honors released Tuesday, Portsmouth’s Matthew Fraulini and Wheelersburg’s J.J. Truitt. During his junior season, Fraulini averaged 16.3 ppg, 3.2 rpg, 1.7 apg, and 1.4 steals per game while Truitt averaged 10 ppg, 4.0 rpg, and 2.0 apg during his sophomore season in the orange and black. Three Scioto-Countians were named special mentions in the Division IV all-state honors: South Webster’s Shiloah Blevins, Green’s Gage Sampson, and New Boston’s Kyle Sexton. Blevins averaged 19.0 ppg, 12.0 rpg, 4.0 apg, and 3.0 bpg during his senior year for the Jeeps while Sampson averaged 19.0 ppg while shooting 57% from the field, 11 rpg, 1.5 apg, and 1.4 spg during his junior year under head coach Dirk Hollar. In helping lead New Boston to their first elite eight appearance since 1960, Sexton averaged 20.4 ppg, 16.2 rpg, 3.0 spg, 5.0 apg, and 1.5 bpg During his sophomore season. In the honorable mentions list, Green’s Tanner Kimbler and East’s Will Shope rounded out the nominees from Scioto County in the all-state honors. Kimbler finished his senior season averaging 20.2 ppg, 2.5 apg, 2.4 rpg, and 1.2 spg while Shope finished his senior season averaging 17.1 ppg, 4.1 apg, and 3.9 rpg for the Tartans.